Tribulus terrestris is a tropical vine common in sandy soil throughout India, Pakistan, and Sri Lanka. 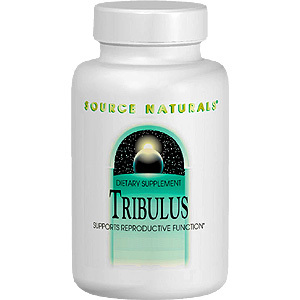 Source Naturals Tribulus contains over 40% furostanol saponins, the active component. This south Asian herb is popular for its potential role in supporting reproductive function. Tribulus can be used by both men and women. Tribulus terrestris 750 mg (minimum 40% furostanol saponins). Other Ingredients: Acacia gum, stearic acid, colloidal silicon dioxide, and modified cellulose gum. Tribulus is shipped in a discrete, unmarked package. Orders are processed immediately and usually take about 3 to 5 working days to be received. We do ask that you try it for 2 to 3 weeks to feel the full effects. Any information received is used only for order processing and shipping purposes. Your information, such as e-mail address, will never be disclosed to a third party.